1 Comments Published by Cedric Benetti on Thursday, November 5, 2009 at 11/05/2009 08:32:00 PM. 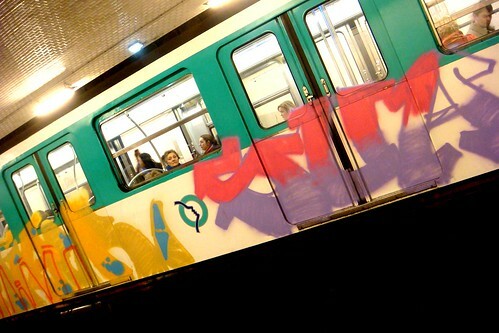 Somehow there has been an immense augmentation of graffiti artists spraying illegally on the trains in stations at nighttime, especially the trains on line 3. Let's hope they manage to put something fun on it and they don't get caught. Some people call this vandalism, and it usually is, but if it is tastefully done and in great colors, it can brighten up your day. 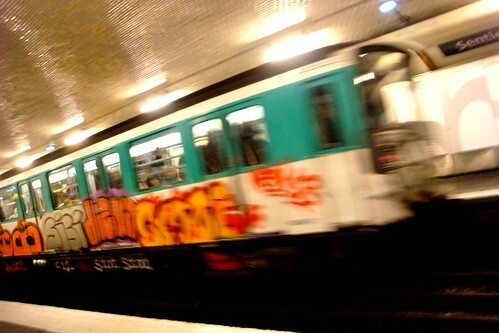 It may not be the best graffiti in Paris but still makes those trains look much better.